I also received some patterns from The Scarlet Letter while I was away. 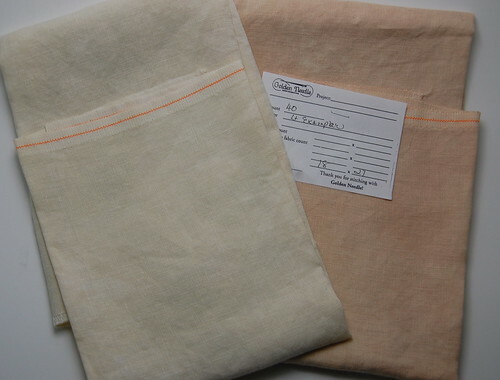 AVAS Soie 'd Alger silks and 36 ct. Vintage Pearled Barley Linen. 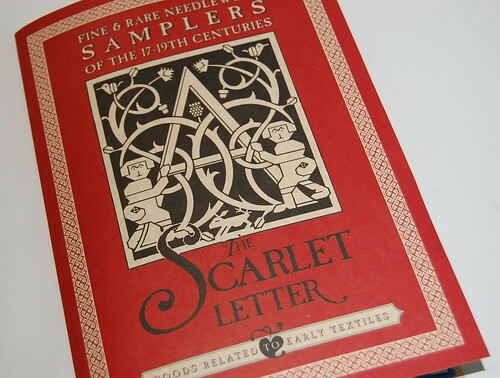 I also ordered the catalog from The Scarlet Letter and now my SL wish list has grown immensely! 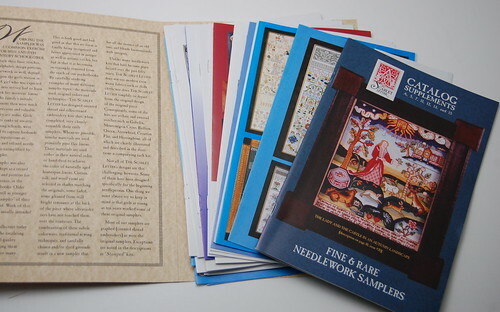 The pictures are much clearer in the catalog. Nice stash! I shouldn't have gone to look at Sarah Wilson. Agh! Gorgeous! I may have to get her next! I keep wanting to order more designs from Scarlet Letter! lol! 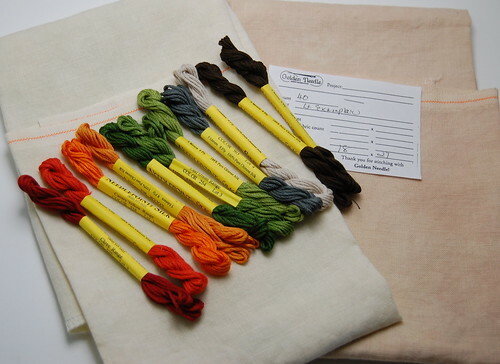 Nice stash, Nicole - it sounds like you had a fun vacation with your stash shopping! Great stash! Glad you are home safe and sound. Nice enhancements to the stash, Nicole! I've recently added Ann Smith myself...she's lovely and the chart...like a book!!! Not sure when I'll be starting her...but at least I know she's here! Love the linen etc! Nice! 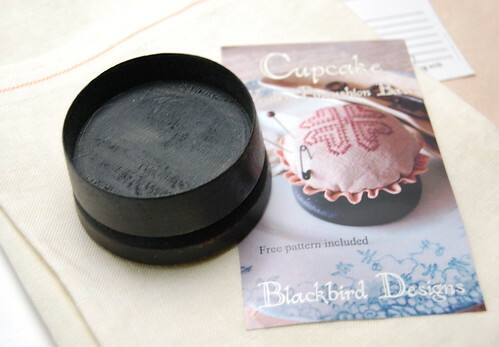 It looks like you will have fun with your new stash! My grandparents used to live in Lake Panasoffkee and I remember feeling like they lived in the middle of nowhere and that it took forever to get to a store or restaurant! Nicole, beautiful stash. I always wondered about the paper catalog, and now I want one also--they look much better than the photos online that just don't quite blow up large enough. Oh, and I got my Ann Smith chart, and I'm going to take a day off on Friday and go to the LNS so I can buy fabric and silks. So exciting! Looks like you had a great trip! Glad you made it home safely. Silk Road is my LNS, yet it is about an hour or so from my home. What did you think of the store? I really like it! They are packed in, but very helpful! I'm likin' the LL Vintage Bisque. May have to get me some of that. Likin' the silks and "Sarah Willson," too. In fact, I'm likin' all of your great new stash and progress pics. Can't wait to see your future progress on these fantastic projects!! Wonderful stash. I will look forward to seeing your progress on the SL designs. You've got some beautiful colours on Ann Smith! Lovely new stash. Glad you had a good holiday. Great stash - can't wait to see some stitching pics! 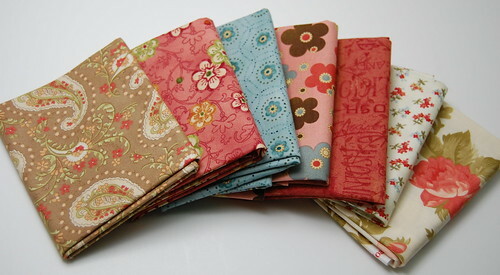 Wonderful stitchy stash, just love new fat quarters. Happy Stitching! Woohoo, Nicole. Great stash stuff. I think it is your reward for all the driving you had to do. I have the SL catalogue, too. 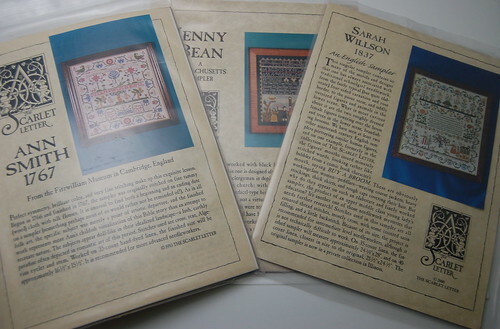 I agree with you that seeing the samplers more clearly is a dangerous thing for the budget! Wonderful stash haul Nicole. I've fallen for Ann Smith too... and my SL list just keeps growing and growing. Nicole, now that looks like a great vacation in stash! Lovely. Fantastic Stash! Now I'm going to be combing the SL site for those. Dang it! I never got the paper catalog, but I might have to get it. I just get their quarterly flyer. Sorry I had not seen that you had put the links thanks to you! Wonderful stash you got! So many different new projects to choose from! Did you already decide what to start first? Love your stash! Those Scarlet Letter designs are gorgeous! Great stash! I LOVE the fat quarters. Such pretty patterns. I'm glad you had a great vacation, but so glad you are back.